As has been the case so many times before, Gor Mahia’s off the field problems came back to bite them. Coach Hassan Oktay has blamed inadequate preparations that were occassioned by a player strike. “It is not a secret, everyone is aware of what has been going on, the players were not prepared for the match. They have missed what could have been important sessions before the game. Remember we played on Wednesday in the league, and it could have been vital for us to have training sessions to plan for the game, and that did not happen,” Oktay said to goal.com. Oktay also said the off the field problems caused a lack of motivation. “Bringing players for such a huge game knowing that they are not well motivated is not easy, they were not ready psychologically and you could see that,” the head coach rued. This is the biggest club match any of these players has ever played, an opportunity to showcase their talent to potential suitors and the players were neither prepared nor motivated. The poor performance will renew calls for Sportpesa to pay players directly and for much needed reforms to enable the club to be run by competent people. Oktay challenged the club management to bring an end to such issues. Shakava, Batambuze, Wendo, and Tuyisenge ). At left back, Oktay deployed Geoffrey Ochieng who conceded the free-kick that led to the first goal and was beaten on the second goal. “It was unfortunate for him, yes, the goals came from his department but it is a learning experience for him. We missed Shafik Batambuze at the back, he has massive experience that could have helped us,” said Oktay. Wwe chukuwa bodaboda ya kondele. Stupid and useless Ingwe supporter. Keep off Gor Mahia affairs and we are going to get your details from cyber crime intelligence sources. Wewe tulia tu Khwisero huko Kakamega usiende juu huna kazi ulitaka uende kufanya nini huko na wewe ni mtu wa mkono ingwe? Mambo ya Gor apana tambua wewe bwana Benson Disi? Rather unfortunate events at the club.one wonders where all that cash goes to. Meanwhile am not too sure about this Sempala guy,haven’t seen much of him,but the jury on him is out!! You play and win the Kenyan premier league, you don’t earn anything apart from statistics and verbal praises. You reach quarter final stages of the continental games and you’re left unpaid. You board an airplane to North Africa to represent your club then sleep at the airport floors yet money was released to accommodate you enroute to your venue. Sportpesa releases funds to pay your salary yet you lag behind by 2 months on salary payments. No patriot however disciplined will still don a jersey and play his heart out to win a game from which he will earn nothing in bonuses. None so far. The players have mouths to feed. We can’t blackmail them by chanting useless slogans like mara “love for the club comes first”, mara ” win the game and protest later”, mara “just play to win potential suitors”… All that is nonsense. The players have suffered a lot. No wonder they bolt out of the club at the slightest offer of better contractual terms to clubs younger than us like Nkana, Simba, St George, Vipers, Sony Sugar and Yanga. Kahata and Tuyisenge are on their way out. Who would stay anyway? @Jambita Atusi, you are real maggot. The salaries have never delayed for two months. Big elephant has been with outstanding allowances and bonuses that are eventually paid. Why has the club Chair not come out to comment about this issue. Why is it that it’s only the coach lamenting. What is the official EC position on this boycott matter. If the players had been paid all their due salaries how can they strike simply coz of allowances. The club has not denied that it owes the players the bonuses. It does not make sense. There is a deeper problem in the club. But the corrupt Chair and his ilk in the EC must shut-up coz it will end up exposing the of rote in the club. As much as I’m against Oktay tatctics, why is he the only one talking about the issue, the EC has 9 members if i’m not wrong, where are they and why the silence!!! Well, this is where Jodala comes in… it’s time to expose the players who have run to KRA with the club financial records. It’s time to count the non-Luo players to lay blame on them. It’s time for the club Executive to remind players how useless they are. As expected, the result was greeted by furore from the club’s vocal supporters, but what many did not know is that the Gor players played under distress. “We had a brilliant training session on Friday. For the first time in a long time the players were quite fired up. I left that session knowing that we would beat them (Berkane) 4-0,” said Gor coach Hassan Oktay. 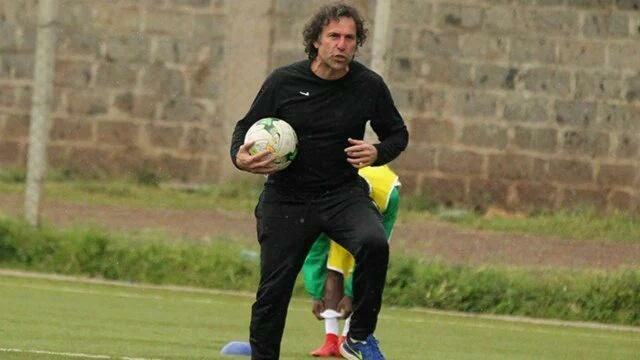 In an exclusive interview with Nation Sport Oktay poured his heart out: “On the day of the training I was sick and shivering because I had stood in the rain in Kericho and later travelled to the sweltering heat in Kisumu, but I was up by 6am so that I could make the final training session at Camp Toyoyo. I wasn’t feeling well but the last session is very important because that is where a coach gets to give his players the magic touch. “I got to the pitch and realised that there were no players to train. There was a strike. I was so disheartened when my assistants told me that the players would not be coming. And indeed none of them showed up. And they didn’t come for night time camp either, meaning that we couldn’t monitor their sleeping schedule or their night activities. Indeed, a lot had happened in the days leading up to Sunday’s fiasco. When Nation Sport arrived at Camp Toyoyo to cover the team’s final training session on Saturday, they found Oktay and his assistants sharing breakfast of chapati and porridge sold to them by a street food vendor. They remained idle way after their breakfast until 10am when they left for Kasarani for the pre-match press conference. The player’s action so angered club chairman Ambrose Rachier he promised drastic action against them, and those close to him say that he is thinking of disbanding the entire team. “These players were on strike about something else that we don’t know. It is not about their dues. And it is something that has been going on for a while. Now I will be forced to take drastic action and I have told them already. I know the culprits,” he said yesterday. But a deep look at the issue reveals an simmering underlying problem thatnow threatens to destroy the very fibre of Kenya’s most widely followed club. Six senior players who spoke to this reporter in confidence revealed details of what they feel is ill treatment and lack of respect from officialdom in the course of this year’s CAF competition. “Twice this year we have slept at airports while on transit to North Africa. Once we were in Dubai for about nine hours and the officials present did not even give us any pocket money nor did they organise for us to have any meals. “We were left to fend for ourselves in those expensive airport eateries. Yet they owed us money. “It was even more humiliating when Simba (a Tanzanian club) players were also on transit in the same airport and they passed by us on their way to a hotel that had been booked for them and saw us sleeping on the floor,” one of the players revealed. Rachier admitted the players were owed winning bonuses and training allowances. He, however, quickly added that those dues would be paid when the money became available, and not when players used unorthodox means to arm twist his secretariat. “I will not listen to blackmail. These players are on contract. If there is a dispute they have a captain who can reach me so that we can discuss. In fact, according to employment law, bonuses are paid at the discretion of the employer. There is no fixed date to do so. We shall pay the allowances when the money is there,” he said. Rachier’s statement now pits the management at one side and the playing unit on the other, with the players claiming that they are tired of being lied to by the secretariat. “Those are just lies we have heard for years. Can you imagine that the league prize money hardly ever gets to us. We are usually just taken round and round in circles with empty promises until you realise the season is over and you have no money in your pocket. “The whole of this season we have not seen a shilling in winning allowances and bonuses be it in league matches or CAF matches. And that is Sh10,000 for CAF games and Sh5,000 for local games. “We can understand that the club dos not have money. But there are people who cannot understand that. Like our parents, our children. our dependents, and people whose bills we have to pay,” one player said. “Most of the team members see no reason of going any further in this Confed Cup when they will not feel the benefits in their pockets. Most of them are looking outside and they feel they have marketed themselves enough,” the same player said. “Those are key players but once they start to negotiate with a potential suitor, the management will start spinning stories that they are indiscipline or have ran away from the club. That is not fair,” our sources said. Gor’s quality is not in doubt, but not their management. Ambrose Rachier sounds funny and critically incompetent by spewing useless comments like “We know the 6 players who organized the strike and we will take stern action against them”. By the way, Gor keeps losing quality players to neighbouring teams and replacing them with mediocre pickings like Mustapha. You can’t fire this current squad, they are competent enough though mistreated, demoralized and molested. Your threats are a mere diversionary tactics from your incompetence. No ambitious player would shun offers from our neighbouring rivals and sign for Gor Mahia so stop your baseless threats. Quite some horrible reading from the press, very sorry state of affairs, very bad. Some of us didn’t have the first hand information of what transpired, ooooh nooo, why do we have these charlatans passing for club management surely? When players failed to report to training and camp- meaning they were on strike. Strike has legal procedures to follow to make it lawful. Players were on illegal strike if they did not notify the office. Rachier should initiate investigation on the same and take appreciate action. cup competition but not an international match-where you market yourself. Teach these players some basic manners. George aduwa,do you normally listen to yourself while talking or do you always read whatever you’ve written before you click post comment. Football is a professional game and players sign contracts stipulating how they are going to be remunerated and how they earn bonus and allowances. If according to the players, winning a match in domestic league is 5k and winning in continental match you earn 10k,what is wrong if you demand what you’ve earned. I believe that you are a fun of TV football who can even fail to watch a local match even that of Gor mahia against any local team if maybe Manchester city is playing against Liverpool because you don’t care about the local leagues yet those players in Europe also work heard to earn winning bonuses. Always put yourself in the shoes of these players before you condemn them.I stand with these players and maybe Ambrose Rachier have reached the peak of his usefulness in Gor mahia and can talk recklessly without thinking of the repercussions of his talks. When Ambrose Rachier had the interest of players at heart some four years back ,there was also awarding of players at the end of the season where we had club player of the season, club defender of the season and also fans favorite player who were recognized and awarded accordingly. But nowadays it’s like he is tired of winning the league and the players have become his enemies by doing well. Think before you talk.I wish the SGM will bring some sanity in management and this great club will start doing things professionally. @Michael Ogolo, you are the most useless idiot who does not know what you are posting. Do not open your stinking mouth on my comment. Useless maggot. I repeat that ring leaders no matter their stature in the club should be dealt with and be example to the rest of the team. Where is the money? Salaries were paid on time. Do you want the office to use your sh*t to pay players their bonuses and allowances? The only way forward is to restructure the club, reduce the wage bill, and have it run professionally. Most of us make noise on this platform but when the AGM/SGM is called we are too busy to attend such. We then end up with the management we deserve. And why do we think all the money from Sportpesa can run the club efficiently? Why don’t we ever get a financial statement from the club? Gor’s wage bill is high and we should now find ways of reducing it but still maintaining our quality. On this issue that is coming out it shows that even the players lack leadership within themselves. So we have a a rudderless EC and an leaderless playing unit. So bad. Who has now lost more? The club or the players? Or the fans? Dan, it’s not about the large wage bill, it’s managing that is the problem, if you have limited resources you try and manage it efficiently and to the satisfaction of all. If you have promised to pay for something/work, you pay it as promised, you do your part and see if the worker will default/breach his/her part of the contract. Any other argument will never and I say never make sense. From what I am reading about the strikes and all that have gone on, it is not looking very pleasant. The timing is off the mark and I just do not know what to say. Though I have some more questions and fears. Is any one privy to the information of how much each player is owed and for how long? This at least can give us some direction on how to objectively comment. 2. How long can Coach Oktay hold on? I feel that he is being subjected to carry burdens that are not his. Why should he be left to plead with the players as if they are playing for him alone? Weather a good professional or not, we have not heard complaints and strikes from players about his philosophy. 3. Supposing that every money owed is paid before the second leg, will they turn the game around? 4. I suspect that there is an iota of some players not so sure of their stay after their contracts and could be on their out. I am just thinking loud. 5. If it is true that players never showed up for practice and spent out on the eve of the march and just showed up for the Match, then I agree that they lost it before they even played. My question is when they were doing this, did they have fans in mind? Don’t you think that they will have to work extra hard to regain that confidence and trust from fans? 6. Finally, Discipline MUST BE INCULCATED HOWEVER COSTLY IT IS GOING TO BE. I can see you only think like a fan and not like even a father of a soccer player. And who told you that am young, and for your info,am not a fan of European football. I always watch kpl,super division of Zambia, and PSL of south Africa known as ABSA premiership. I only read news about those European teams that majority of TV watching bloggers crave for. /George Adua your spot on…..some bad apples must be eliminated from the squad..
Omera Dan these people need a handshake. The e executive k s stinking on corruption.any updates thura? Is the team off yo Mombasa yet? this club last year in a Foreign land during CECAFA tornament, they were at it again in the money bracket tornament of Caf.Where in this World would a staff go on strike because of allowances & bonuses.Those dissatisfied should ask for release letters and join our competitors in the KPL who pays allowances & bonuses in good time. Let drastic action taken against the masterminds of the strike.